If 2015 was the year analytics tools became ubiquitous in enterprise software, 2016 is shaping up to do much the same for machine learning. Just last week artificial-intelligence startup Nervana launched an offering that promises "deep learning on demand," and on Thursday Hewlett Packard Enterprise released a product of its own for what it calls "machine learning as a service." Dubbed Haven OnDemand, the cloud platform offers machine-learning application programming interfaces (APIs) and services designed to enable developers and businesses to build data-rich mobile and enterprise applications. 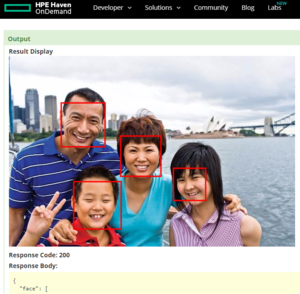 Face-detection capabilities are included in Haven OnDemand. Haven OnDemand entered beta back in 2014, and at the time it had just a few APIs, said Fernando Lucini, HPE’s CTO for big data. Today there are more than 60, along with services that deliver deep-learning analytics on a wide range of data, including text, audio, image, social, Web and video. Advanced text analysis, predictive functions, knowledge graph analysis, and speech and image recognition are all among the capabilities the service includes. A section of the product devoted to data connections makes it easy to develop applications that tap data stored in various locations, such as SharePoint or Dropbox, Lucini said. "In machine learning, one of the hardest things is to find the elements to build your model," he explained. "We have an entire section to allow you to get at corporate or personal repositories of knowledge and bring them into your analysis." Delivered as a service on Microsoft Azure, Haven OnDemand is available as a freemium service, with commercial pricing for enterprise-class delivery. It's now used by more than 12,750 registered developers, HPE said.